Protests were held around the country to demand justice for Tamir Rice, the 12-year-old Black child killed by cops in Cleveland, in response to the long-expected grand jury decision, finally announced on Dec. 28, not to indict the police officers who killed him. After 13 months of stalling, word went out at 1:40 p.m. on Dec. 28 that Prosecutor Timothy McGinty would announce the grand jury’s decision at 2 p.m. that same day. Protesters chanted and marched on the streets of Cleveland, shutting down traffic in all directions on a day with the worst weather of the month. Nothing was going to stop the anti-racist fighters, who traveled more than 3 miles in icy rain to the First District Police Station, the murderous cops’ precinct. The next day, more than 200 demonstrators gathered at the downtown Cleveland “Justice Center” — aka police headquarters — and again took to the streets. Demanding the resignation of racist Prosecutor McGinty, they avoided police roadblocks and sat in at intersections. When protesters attempted to enter the entrance ramp to the Interstate 90/Interstate 71 Innerbelt Bridge, police started to march in military formation, blasting sirens and threatening arrests. A strategic decision was made by those present to avoid arrest that night but to continue marching and blocking streets around Cleveland’s casino. 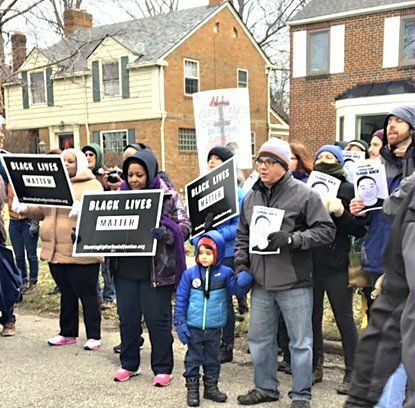 Militant downtown protests continued on Dec. 30 and Dec. 31 in Cleveland, and on Jan. 1, almost 300 people gathered on the city’s West Side to go to the home of Prosecutor McGinty. A die-in was held on the sidewalk with folks lying down for four minutes — the amount of time Rice lay bleeding as the cops stood around, figuring out how to twist their story. The march and die-in were led by Rice’s family members, whose main demands are the immediate termination of Officers Loehmann and Garmback, a federal Department of Justice investigation of McGinty and his removal as Cuyahoga County prosecutor, and a DOJ investigation into Rice’s shooting and murder. Black Lives Matter Cleveland, Black on Black Crime Inc., the Black Man Army, the Greater Cleveland Civil and Human Rights Network, the Cleveland Immigrant Support Network, the Ohio Student Association, Showing Up for Racial Justice Northeast Ohio Chapter and the Tamir Rice Justice Committee were all part of this powerful action. As stressed by Black Lives Matter Cleveland organizers, Cleveland won’t rest until there is justice for Rice. They are prepared to take their demands to the Republican National Convention, to be held in Cleveland July 18-21, and beyond. The Dec. 28 nonindictment of Rice’s killers in the Cleveland police department was met with an immediate wave of anger and protest in cities and areas around the United States. Some of these protests are described below. 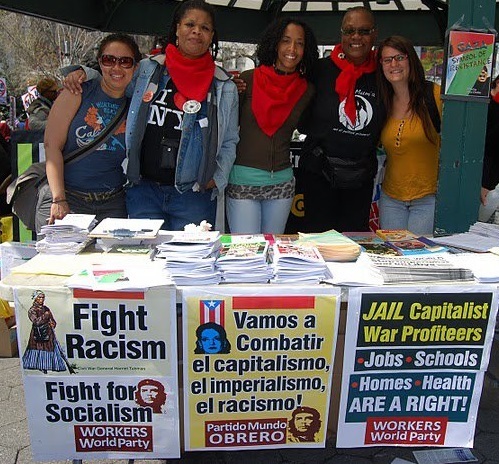 In New York City, anti-racist activists took to the streets that very day, gathering at Washington Square Park in Manhattan, and then marching to and over the Brooklyn Bridge. 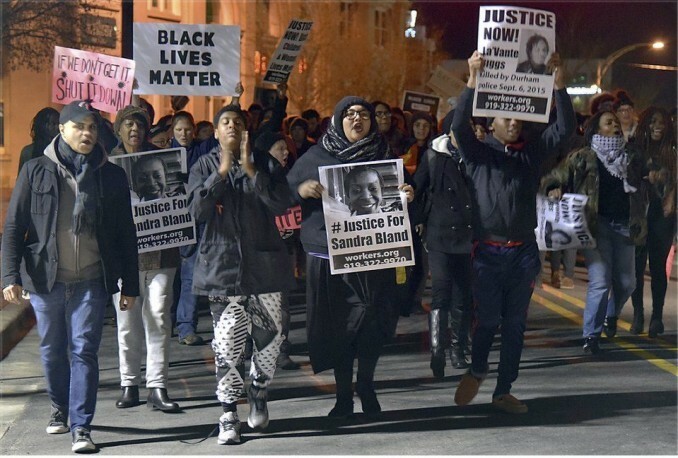 Two days later, the Dec. 21 nonindictment of Sandra Bland’s killers in Texas was protested at a two-hour vigil in New York’s Union Square. The rapid response to the Rice decision came from an ad hoc coalition formed by members of the city’s movement against racist police killings. Months ago, Black Lives Matter NYC, the People’s Power Assembly, NYC Shutitdown and Millions March NYC had agreed on a protest time and place. After going over the bridge, the marchers took over busy Brooklyn stores like Target, crowding the escalators and shaking the building with chants. A rally of about 200 was held Jan. 2 at Oscar Grant Plaza in downtown Oakland, Calif. “Bay Area Rises Up for Tamir” was the title of this action, called by Black Lives Matter Bay Area and the Last 3 Percent Coalition in solidarity with Tamir Rice’s family. Mama Ayanna Mashama opened the rally with libations. 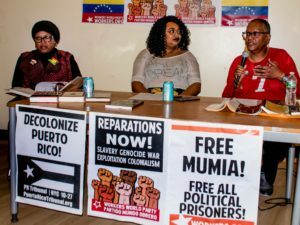 Other speakers included Adam Jordan Wills, from the Anti Police-Terror Project and Ada Henderson, the mother of Richard Perkins Jr., who was killed by the Oakland Police Department on Nov. 20, allegedly holding a pellet gun. 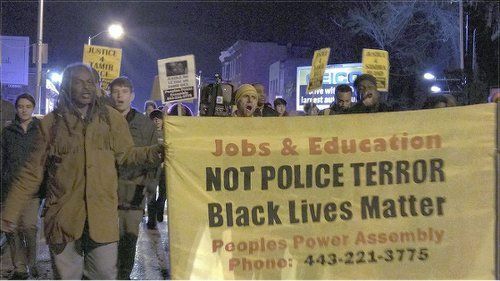 The Baltimore People’s Power Assembly called for an emergency protest in response to the Tamir Rice and Sandra Bland nonindictments. With one day’s notice, close to 100 protesters took to the streets Dec. 29. Activists gathered at the intersection of 33rd Street and Greenmount Avenue in Baltimore’s working-class Eastside. They rallied and gathered supporters from the community who joined the march to North Avenue, where the group took over the streets before being surrounded by police. Despite the heavy police presence, the PPA held an impromptu people’s assembly in the middle of the intersection. Community residents and PPA members spoke out at the microphone about current police abuse, joblessness and oppression in Baltimore. The group ended with the Assata Shakur chant [“It is our duty to fight for our freedom. It is our duty to win. We must love each other and support each other. 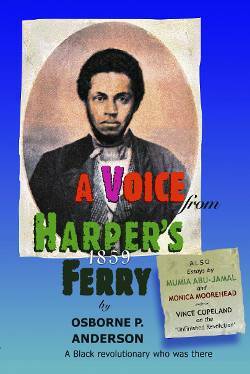 We have nothing to lose but our chains.”] and marched back to the original gathering point. Syracuse, N.Y., activists demanded justice for Rice on Dec. 30 by rallying downtown in the shadow of the Chase Bank building. Protesters held up giant letters that spelled out Rice’s name. Curbside speakers included a white former law enforcement employee who said he had quit that system and stated unequivocally, “We are living in a white supremacy world.” The rally was initiated by the Syracuse Community Choir and the Syracuse Peace Council, with participation by the Syracuse chapter of the Southern Christian Leadership Council, Central New York Veterans for Peace, the Palestine Solidarity Collective and others. After holding a rally in downtown Detroit on Dec. 29, a group from Black Lives Matter Detroit drove to Cleveland to join the protest there. Called out by the Buffalo Anti Racism Coalition, a crowd gathered in downtown Buffalo, N.Y., at the U.S. Attorney’s office on Dec. 30. Photos: Durham, N.C., Kevin Smith; Detroit, Martha Grevatt; Cleveland, Susan Schnur; Buffalo, N.Y., Ivy Yapelli; Baltimore, Sharon Black; Syracuse, N.Y., Minnie Bruce Pratt; Durham, N.C., Patrick Snipes.